You’ve created an account, and you’ve been tweeting for some time. But now, you’ve come to a roadblock. It feels like you have already covered everything, and everything you share with your audience is old. And the last thing you want to do is make your audience bored. No matter how hard you try, you simply cannot come up with any new ideas, and you are struggling to keep your Twitter presence alive. And the fact that the recommended number of tweets you should share a day is 1-5 doesn’t exactly help either. It only puts more stress on your shoulders. The good news is that after this article, you’ll never have a tweet drought ever again. In this article, I’ll list 19 Ideas for your next Tweet. Sometimes, you really don’t have anything to share with your audience, and when this is the case, you need to make sure you know that it’s not about you having a draught, it’s about you really not having anything to share. When you are desperately trying to reach the “limit” for maximum engagement that is 5 tweets a day, there’s a big risk that you’ll compromise on quality in order to keep up the quantity. Of course, this is something you want to avoid, because when you compromise on quality, your audience will quickly notice, and your tweets will have a contrary effect instead. Make sure you put great thought into what you are going to Tweet, and how you’re going to arrange them. is For optimal results, you need to make sure you have thoroughly controlled your Tweets and checked for things like grammatical errors, and if the subject of your Tweet really is relevant to your brand and your audience. A posting scheme, schedule and content strategy varies a bit between each other, however, what you need to focus on is knowing what your brand’s values are, you need to define who your target audience is, and what content resonates well with them. You also need to set goals with how many posts you strive towards posting, but as mentioned earlier, you should never quantity go before quality. Don’t post lousy content because you are trying to keep up with your goal. Now that you know all of the things above, it’s time to look at some ideas for Tweets that you can use. Twitter trends is a great tool to find new trending topics that you can Tweet about. 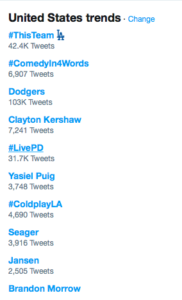 The best part is that trending subjects on Twitter will gain you lots of traction if used in the right way because there are a lot of people joining in on that trend at the same time. You can either choose to get “Tailored trends”, which are trends relevant to you in terms of location, previous interactions or so on. Or, you can choose to see trends from all around the world. You can also choose to search for trends based on a location. When you hop on trends, you don’t only gain more traction, but you also show that you are up-to-date with the latest news, and hopefully, you’re choosing to tweet about a trend that your audience cares about. 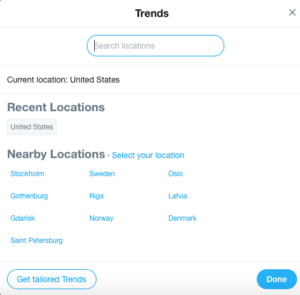 The Twitter trends section is located visible to the left of your timeline and is regularly updated, which means that if you choose to create tweets around trends, you can be sure to always have fresh new subjects to tweet about. As a brand, you’re probably receiving quite a few questions from your audience If you notice that the same questions are being asked over and over again by different people, it might be a good idea to make a tweet answering the questions that many people might have. You can also pin a Tweet with an answer to a FAQ so that people can quickly see the answer. 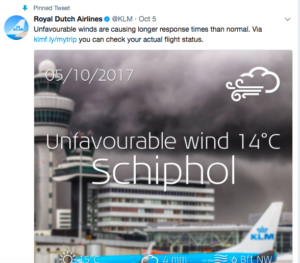 Here’s an example of a pinned Tweet by Airline KLM. They have chosen to pin a tweet that probably concerns a lot of travelers, and gives the answer to a question that many might have, and would have otherwise asked them, expecting a response. In that way, fewer resources will be needed, because you can answer everyone’s question with only one tweet, instead of responding to every single one that is asking the same question. There are split opinions about quotes. Some people think that quotes are out of style and unpopular because they’ve existed for a long time, and people are using them all the time. In other words, they’ve gotten boring. 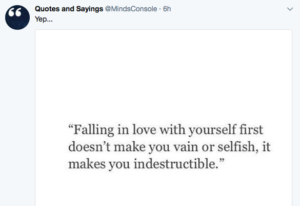 However, some people love quotes that resonate with them, and they’ll gladly retweet your quote if this is the case. Preferably, you should only share quotes if you are really out of ideas because they can quickly get boring if you make it into a habit of sharing them. But when you do, make sure the quotes are closely related to your brand’s values and your niche. That way, your quotes will resonate better with your audience as well. Also, don’t forget to give credit to the author of the quote as well! Hashtag holidays are similar to Twitter trends, only that they are occurring every year. If you’d be aware of all the hashtag holidays, you’d be surprised, because there are holidays every week! All hashtag holidays will obviously not be relevant to your brand or audience, and therefore, it’s important that you check out the ones that are relevant to your brand and only join those that are. You don’t want to be praising national cat day when you’re a shop that sells dog equipment. Your audience won’t resonate with it, and it will generate bad results. In SproutSocial’s National Hashtag Holidays calendar, you can see every single hashtag event that is happening, and join those that are relevant to your brand. If you are attending events related to your industry, Tweeting about it is a great thing, because it gives your audience a chance to attend it and meet you in real life. Even if you’re not attending it, you can share tweets about industry events, because chances are that your audience will find those events interesting. In fact, they might even thank you for giving them a heads up. Behind the scenes is always great for building better relationships with your audience. Most brands only present a perfectly polished outside to their audience, and they are not showing any emotions or humanity. This makes it hard to build any relationships with them, and as a brand, having relationships with your audience is extremely valuable. By sharing behind the scenes tweets, for example by introducing your co-workers or showing your workspace, you’ll show what really goes into your brand, and make it more approachable. When you do, your audience will have an easier time engaging with you, and ultimately, they’ll build trust in you. While Twitter is a platform dedicated for text, visual content works extremely well. And really, it’s not very surprising that it does, because the human brain process visual information 60.000 times faster than text. What’s more, 90% of the information transmitted to the brain is visual. The bottom line? Share more visual content – even though Twitter is a text-driven platform. On Twitter, you can share both photos and videos, but whatever you do, make sure they are short and snappy. Twitter is a platform that is meant to be quick and fun. There’s a reason to why there’s a 140 character limit. 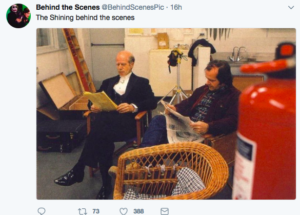 When sharing visuals, a good tip is to share “behind the scenes” content, because, well, you now know the benefits of it. The opportunities are endless with visual content, but make sure you never forget to make it short and engaging, because that’s what makes a great Tweet. This is especially relevant if you have your very own blog, because many brands that do, then uses Twitter to draw traffic to their articles. However, just because you don’t have a blog doesn’t mean you can’t share other people’s blog content. Again, relevancy is extremely important. If you are sharing other people’s blog posts, you need to make sure that it is relevant to your audience and that they will find it interesting. 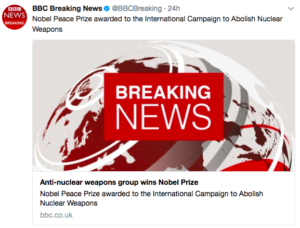 Al news sites are using Twitter to draw traffic back to their site, and thanks to the fact that Twitter allows for clickable links as opposed to Instagram, It is a great tool to drive traffic by sharing your work. If you share articles regularly on your blog, then share those on Twitter as well! If your articles are relevant to your niche, then chances are that your audience will find your articles interesting! Twitter makes it easy for people to scroll past the Tweet, read the caption, find it appealing, and then click through to read the full article. When you share articles on Twitter, just make sure that whatever you share provides value to the reader. And even more importantly, make sure you never use click-bait titles or trying to mislead your audience just to get them to click on your article. This will only make them lose trust in you, and it will also make them angry. 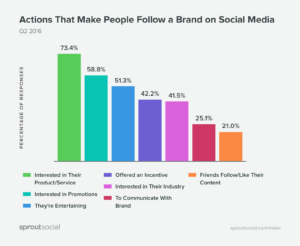 In fact, 58,8% of people follow a brand just because they want promotions. What does this mean? Give your audience what they want. This also means that you get two benefits in one. First, you have something to tweet about, and second, your audience loves it. When you share promotional coupons and codes, you give your audience a reason to come back to your page. If you are feeling even more generous, you can even give away things to your audience. 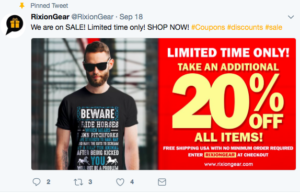 RixionGear knows the importance of this and regularly share special deals and discount to their audience. What’s more, they also create eye-catching and appealing visuals to further boost interest. They also pin their special deal post at the top so that no-one misses it. If you’re facing a drought in ideas, why not take the time to show your appreciation to the most loyal supporters for your brand? Tag them in their tweet and thank them for their loyal support. If they were loyal before, they’ll become even more loyal now, because you show them that you appreciate them and that you value them. Remember that without your customers, you would be nowhere, so the least you can do is thank them every now and then. You can tweet about both industry news and brand news. People love to stay updated with the latest things that are happening with your brand and get the latest insights. If something new is happening n your brand, for example, you’re soon releasing a new product, or you’re making shipping free for everyone, then tell them! Humans love to be a part of things, and when you make them a part of your brand by telling them what is up, they’ll become more engaged in your brand. It’s also good to share news on Twitter because it shows your audience that things are happening – both in your industry and within your brand. Otherwise, it might seem like you are just some sleazy salespeople that don’t do a lot. One of the best ways to get your audience engaged as a brand is to ask questions. There are a million different questions you can ask, so coming up with one that is relevant to your brand and audience shouldn’t be that difficult. When asking questions, you need to make sure you are staying out of any dangerous traps. Avoid asking questions regarding political views, controversial subjects, something that can be seen as sexist or racist. If you do, you risk ending up in a social media storm that can significantly harm your brand. When you ask questions to your audience, you want to make sure you ask questions that are specific to your audience. Preferably, you should stay away from asking too generic questions as these tend to be less engaging. Ask questions that people in your industry care about or events that are taking place. Polls on Twitter is a fun and engaging way to get the opinions of your audience. 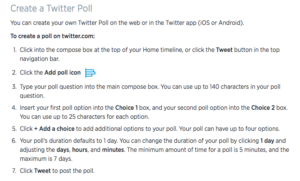 Twitter polls can be used for several reasons, and they are suitable (in different forms) for virtually any occasion. Creating a poll is actually quite easy, and at the same time very effective. Videos increase retention rate and can get your audience more engaged than if you’d use only text or an image. You now know how powerful visual content is compared to text, so I don’t need to repeat myself, but using different types of content on Twitter is a way to make your content more appealing and avoid making your audience bored. Find a balance between text, images, and video and you’ll, have a powerful content strategy that your audience will never get bored of. Twitter has a retweet button. If they wouldn’t want you to retweet content, it wouldn’t be there! Now, it’s important that you stay away from only retweeting other people’s content because that is not a long-term strategy. Most of the time, people want to see content that has actually been created by you, but sometimes, people also want to see the type of content that inspires you, and that you find appealing. The best part is that if you have done your customer targeting right, and defined your target audience, what you find appealing is also what your audience will find appealing. Chances are, you’re receiving questions and tweets that are directed towards you. If and when you receive them, people expect you to respond. They aren’t tagging you because they don’t want you to see their tweet. No, the opposite. A famous example of a brand responding to a customer is Wendy’s. 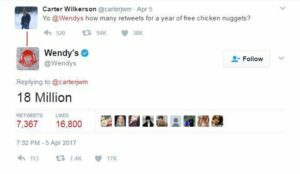 On Twitter, they received a question of how many retweets it would take to get a year of free chicken nuggets, and Wendy’s quickly responded with a challenge. On social media, people expect brands to respond within 4 hours, however, the reality is that brands respond to a customer after 10 hours, on average. Not only should you respond to every tweet you get directed towards you. You should also respond to them in a timely manner. Now obviously, sharing a tweet that you shared last week isn’t much of a retweet. People have probably not forgotten it yet! But when you share tweets that you posted half a year, a year, or even several years ago, that’s when it gets interesting, because you’ll be able to see how much things have changed, and at the same time, you have probably been able to accumulate new people that haven’t seen that post, meaning that it’s completely new to them. I mentioned that you should tweet about industry events and what is happening in your industry, but I didn’t mention milestones. When your brand reaches a milestone, you want to share it with your Twitter audience and make them a part of your milestone. most often, your customers play an important part in you achieving that goal, so this also gives you an opportunity to give thanks to them and show your appreciation to them. Let’s say you’ve now manufactured 100 thousand lip glosses. If your customers wouldn’t buy them, you probably wouldn’t reach that goal. Therefore, while sharing your big milestones with your audience, take that as an opportunity to show your appreciation to them, because this also shows that you value them, thus making them more loyal while presenting you as humble. 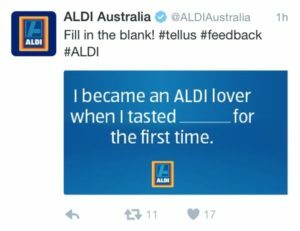 Fill in the blank tweets are the type of tweets that generally receive lots of engagement and comments. THat’s because they’re fun and engaging, and super easy to join. Whats more, they’re also super easy to create. All you need to do is write a statement and underline the place where your audience can suggest a word. When you are posting regularly several times a day, it’s easy to quickly run out of ideas, because it feels like you’ve already covered them all. However, the truth is that there are a ton of ideas you can use when thinking abóut what to tweet, that isn’t yet covered. Whenever you think you don’t have anything to tweet, go back to this list, and I assure you that you will no longer stand clueless on what to tweet! What do you usually tweet about? Are you using any of the listed topics?